A reception will follow the service at the Church until 5:00 PM. Albert G. Siemsen, 87, passed away peacefully February 28, 2017, surrounded by his loving family. He is survived by his beloved wife and best friend of 65 years, Betty, his three children, Jolene (Lori), Craig (Patty), and Erika (George), his grandchildren, Lauren (Micah), Fawn (Tom), Anna, and Lexi, and his great-grandchild, Elliot. Al grew up on a farm during the Great Depression and the Dust Bowl years, living on a portion of his grandfather’s original homestead amidst the wheat fields of Kansas. The eldest of six children, he knew hardship and hard work. Al’s mother Nellie encouraged all of her children to go to school to better themselves. Al embraced this appreciation of education. After he was discharged from the Army as a corporal in 1952, he and Betty married and moved to Whitewater, Wisconsin, where Al pursued a teaching degree. The family moved to Milwaukee where Al took a teaching position at Custer High School. He taught business, but quickly moved into teaching history—a subject he grew to love. He was the chair of the social studies department and delighted in developing a thought-provoking curriculum that encompassed US history and current events. He was a leader in the Milwaukee teachers union, serving as the president of the union for many years. He was involved in the American Federation of Teachers, served for many years on the executive board of the Milwaukee Teacher’s Education Association, and led local efforts aimed at supporting the rights of teachers and promoting public education. Al and Betty raised three children. The family spent many memorable days camping and hiking in state and national parks. He and Betty loved the outdoors and instilled a love of nature in their children and grandchildren. Al was an enthusiastic Wisconsinite who loved the snow and cold weather, and was known for shoveling the walkways of the entire neighborhood after snowstorms. Betty and Al shared many of the same interests and continued to be active during their retirement. They loved biking in Wisconsin and spent many happy hours pedaling along the wonderful bike paths throughout the state. The entire family especially enjoyed biking on the Great River Trail near Trempeauleau, Wisconsin. 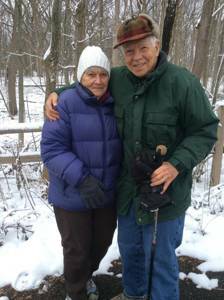 Al and Betty loved their outdoor getaways and often went snowshoeing or hiking together at local nature centers. After retirement Al continued to invest in the lives of young people, volunteering for many years in Milwaukee Public Schools where he was known by many young readers as “Mister Al”, and later as “Grandpa Al”. After teaching high school students for his entire career, he found (with Betty’s encouragement) that he really enjoyed working with the youngest children of Milwaukee. Al cared deeply about the world around him. Over the course of many decades he dedicated himself to social justice work, community building, and environmental issues. He was active in the civil rights movement and in the environmental movement. He was president of a broad neighborhood coalition called Cooperation Westside. He could often be found participating in local and statewide rallies and was a frequent letter-writer to the Milwaukee Journal Sentinel. Al was a voracious reader and had a deep knowledge of both current political issues and the historical context of local, national, and world events. He loved a lively debate and always stood up for what he believed in. Al was a member of the first Unitarian Society of Milwaukee for 58 years and served as the co-chair (along with Betty) of the Social Concerns Committee for many years. He was a Unitarian Universalist youth group leader and served many meals for the Milwaukee Guest House. Al was a humble man, devoted to his community and his family. He dedicated his life to championing public education, progressive politics, public parks, and his Martin Drive neighborhood. He was a Custer High School history teacher for 35 years, a lifelong activist, and a union leader. He promoted change, empathy, and understanding by stalwart example. He leaves behind four generations who have been touched by his generosity and kindness. A celebration of Al’s life is planned for Saturday April 8 at 2:00 p.m. at the First Unitarian Church, 1342 N. Astor Street Milwaukee, WI 53202. A reception will follow the service at the Church until 5:00 PM. Donations can be made to the First Unitarian Society of Milwaukee, Friends of Wehr Nature Center, and Milwaukee Guest House.